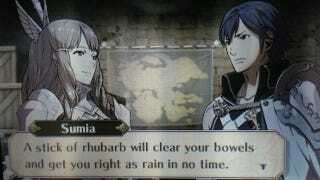 Sure, the Fire Emblem series is known for its well-designed tactical challenges. The newest game in the series, Fire Emblem: Awakening, is no different. But a lesser-known aspect of Awakening is just how romantic it can be. See, when your soldiers (of which you'll amass dozens) fight alongside one another, they get closer and eventually form stronger and stronger relationships. I mean "fight alongside one another" literally—they have to be standing on adjacent squares for this to happen. Eventually, characters can even fall in love, and if they do… well, all sorts awkward things can happen. Here's one example: Chrom, one of the primary characters, and the clumsy Pegasus Knight Sumia, getting to know one another better. Bear in mind that these conversation paths happen across all possible matchings (Male/Female, as far as I can tell) of characters among dozens of different warriors. Adorable. The Music In Fire Emblem: Awakening Is So. Hot. So, yes, this is a game about knights and dragons and battles and noble deeds. But it's also a game about pies, and tea, and true love. And how rhubarb will help keep you regular.